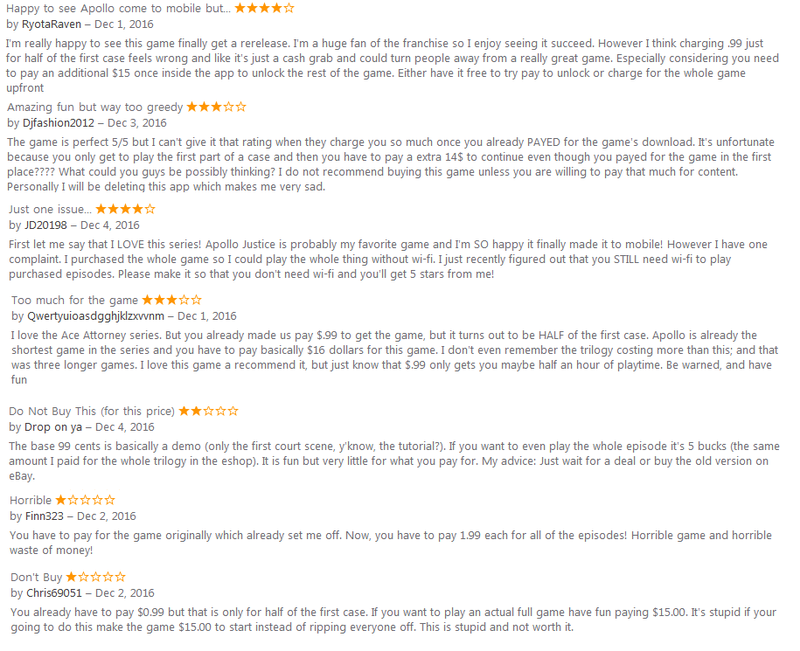 Seven reviews complaining about one central point: The pricing scheme. So, the pricing scheme. 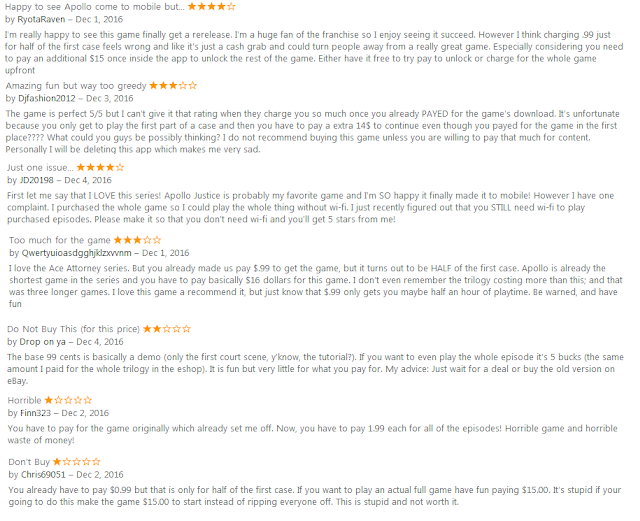 You need to pay $.99 in order to purchase Apollo Justice: Ace Attorney, which gets you the equivalent of a demo. You must then pay an additional $1.99 for the rest of the first case. If you wish to buy all four cases, you can pay $14.99. You can also buy Cases 2, 3, and 4 for $4.99 each. 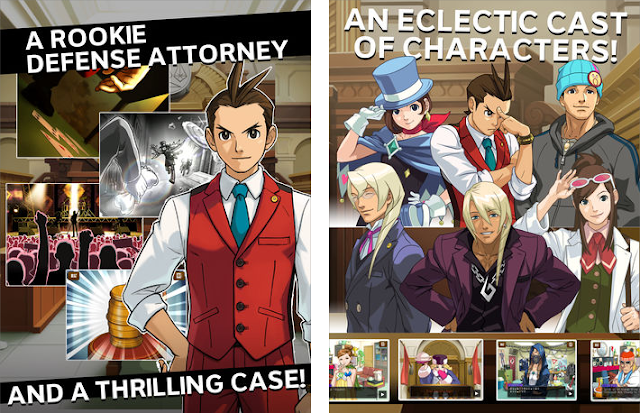 In total, it's cheaper than any other way to play Apollo Justice: Ace Attorney. It's unknown if the game will let you just buy Case 4 for $4.99 and then you can just play only that case, or if you must have completed Cases 2 & 3. Well, someone out there probably knows it, but I'm not in the position to figure it out for myself. Apollo Justice, Klavier Gavin, Trucy Wright, and Ema Skye! If by “all-new” they mean “the exact same content as the game released eight–nine years ago on the Nintendo DS”, then, yes. Sure. I guess? Okay, why is this important? Well, Ace Attorney Trilogy is out on the 3DS (the first three Ace Attorney games — Apollo Justice is the fourth), and the games that make a storyline trilogy with Apollo Justice, Dual Destinies and Spirit of Justice, are also on the 3DS. But Apollo Justice: Ace Attorney is NOT on the 3DS. It's DS-only. I don't think it's a big deal because the 3DS is backwards-compatible with the DS, and you can very affordably obtain a physical copy of Apollo Justice: Ace Attorney. However, it is a big deal that Apple systems are getting something that Nintendo systems are not, given Ace Attorney's traditional status as a Nintendo handheld stalwart. Technically, Apple is getting an exclusive high-definition content version. Not that I think the graphical upgrade matters, and I can confirm that, for a DS game, Apollo Justice: Ace Attorney looks just fine on a 3DS. But the 3DS wants to go to court, too! It's also a big deal to the lazy gamers among us who want to be able to buy the entire Ace Attorney series all at the same time, at the same place, on the Nintendo eShop. Nevermind that buying all of the games at the same time doesn't help you complete them any faster, and even the fastest playthrough of the three games in Phoenix Wright: Ace Attorney Trilogy will be more than enough time for an ordered-online physical copy of the DS version of Apollo Justice: Ace Attorney to arrive to you, so you can have an uninterrupted Ace Attorney franchise playing marathon. Some people are holding hope that CAPCOM will release a trilogy of Apollo Justice, Ace Attorney Investigations: Miles Edgeworth, and Ace Attorney Investigations 2, which would mark the latter's formal localised debut. The more I think about it, the less that makes sense. Apollo Justice has nothing in common with those other games, other than that they're on the DS, and have Ace Attorney in the title but don't have Phoenix Wright's name in the title. That's a tenuous way to make a compilation, especially since Apollo Justice is already in an ACTUAL trilogy of games. That'd just confuse people. Edgeworth doesn't appear in Apollo Justice, and Apollo doesn't appear in a Miles Edgeworth game. They take place in different time periods, too! If CAPCOM wants to increase their sales by selling to a crowd of people on mobile devices that do not appreciate visual novel adventure games for money, that's fine. But mobile systems should always come secondary to the fanbase of Nintendo's systems that are the core of the series. And coming second means they shouldn't get things before Nintendo's systems do. We need a president of Nintendo that will keep Nintendo-system games within Nintendo systems, and will fight for that! If only Ledge Trump won over that Tatsumi Kimishima dude. Under Kimishima, companies are just shipping our games to overseas platforms. It's a total disaster! Ludwig figures that combining Apollo Justice: Ace Attorney with Ace Attorney Investigations 2 would be the only way he would re-purchase Apollo Justice without feeling like he just wasted money, though he recently wasted a bunch of money on Ace Attorney Nintendo 3DS home menu themes he doesn't use. He does not own a smartphone. Super Mario Run, being $10 for full content, is also criticised by mobile people for the same tactic. You can purchase the Ace Attorney games on 3DS for less than Apollo Justice on iOS while they're on deep discounted sales. Finally, after much negotiation, Apollo Justice: Ace Attorney will be coming to the Nintendo 3DS! Another mobile migration: Phoenix Wright: Ace Attorney — Spirit of Justice to mobile land. With how Nintendo is treating Apollo Justice, it's like they don't want him on their system. Court will return to session for Apollo on a Nintendo system on November 21, 2017. CAPCOM has now shipped Apollo Justice to Nintendo. The trilogy was on iOS for a while before it came to the 3DS, so maybe the same thing is happening here. Maaaaaaaybe, but if Trilogy never existed, no one would be asking for an Apollo Justice 3DS remaster/port in the first place. True. 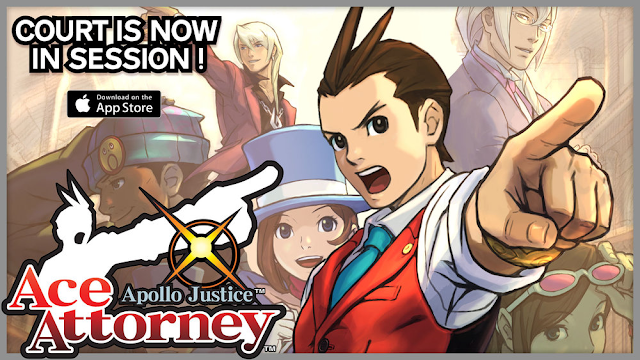 And on one hand, an iOS port of Apollo Justice is more necessary than a 3DS port. Fans who could only play the series on iOS had games 1-3 and 5, which had to be frustrating. If you have only a 3DS, you can still play Apollo Justice. "Add a disclaimer that says Rawk says they're [the graphics of DS games on 3DS] bad and that you may be visually impaired." BUT it's a sentiment people have. You say it's more necessary on an iOS, and I'll continue my point that there's less demand for Ace Attorney and games like it on iOS anyway. Ghost Trick did it better. First two chapters are free then the rest is paid for. This way, it is easier getting people who are on the fence to try it out and if they like what they played then they could buy the rest. I kind of like a barrier to entry, just because that's what handheld gamers have. ...Well, no, Apollo Justice's game did have an actual demo from the Wii's Nintendo Channel. I'm not a fan of the piecemeal episode purchasing, unless you really can just skip Cases 2 & 3 and go straight to 4. Then that's... interesting. Layton Brothers: Mystery Room (which plays like a streamlined Ace Attorney game anyway) had a similar approach. The first two cases were free. Then you could buy the remaining cases as two packs, cases 3-6 for $2.99 and cases 7-9 for $1.99. Any particular reason for that distribution of packs/pricing? I bought a used copy of the game a few months ago in order to have the whole set. I have yet to play it, though. Well if you ever do, factory reset the save data.